Quick easy one step process! Apply to your Thumb and get a comfortable and consistent release! Different colors for different texture! Get the release you desire! Started using this product in conjunction with thumb slug. Found that it provides a better fit those times when my thumb may be a little looser. The different tape friction available does make a difference depending on the bowlers needs. I have used the green tape and my wife uses the red. First time using any tape and was pleasantly surprised to find it fits my needs. I went with the red color, release feels very natural. Got rid of the friction burns and blisters on the back of my thumb finally! I prefer the full length but I have seen others cut them in half and double the use. Skin protectant against calluses, skin scrapes. Smooth release everytime. No problem with the product before or after use. Excellent product! After reading the reviews on Bowling.com I decided to buy the blue pre-cut patches. They stick to the back of the thumb securely and give a consistent release feel. Highly recommend if you want to prevent blisters. Great job Vise!!! I have a callous built up on my thumb. This tape has improved my release & eliminated the irritation I had at release due to the callous. I have tried different bowling tapes in the past and this is by for the best tape that I have every used. The performance is worth what you pay for and even though these are a little expensive. Once you try them nothing else will come in close to the ease of using these precut strips. These pads work great with protecting your fingers or even a calius. I was in a tournament not to long ago and it was my first Tournament where i made it to the finals and needless to say i got nervous. I couldnt get my thumb out of the ball correctly cause it kept sticking because of the sweat. This product solved that and my thumb hasnt stuck yet and that was about 4 months ago. Great Product. this product is the best thing i've found to ensure a clean release every time. no worries with the "stickie-thumb" clean off the thumb is great. I use this product every time I go bowling. I have tried different products. Once I found this product I will not use anything else. By T-Baller from New Orleans, La. the visa patch tape is pre cut which makes the placing on thumb easy. It performs great during bowling, but when removed it leaves a sticky residue. that is the only draw back to this product. These give me a very consistent ball release. I have different colors of them for different conditions for how the ball is releasing off my thumb. Which number tape will give me the quickest release ? Thanks for the question! The blue tape will give you the quickest release. 7 of 7 customers found this answer helpful. Did you? Yes | No Did you find this answer helpful? Yes | No Thanks for your feedback! Hello Pattie! You get one package of 40 pieces for $18.99. Which tape is the thinnest? Hello! The different color Hada patches will be relatively the same thickness, but they will have different textures for different kinds of releases. 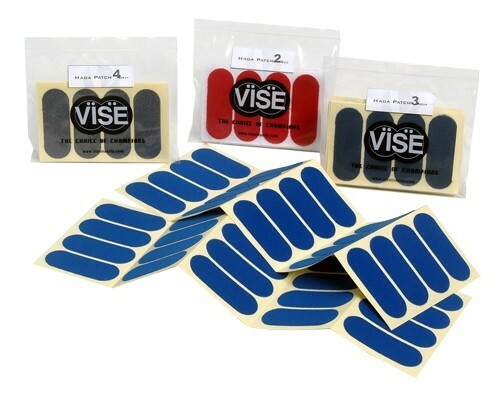 is the vice tape sold in a combo or variety pack? Unfortunately we do not have a combo pack, it is just a 40-piece pack of the color (release style) needed. Are the tapes all the same thickness? Hi! Yes they will all be the same thickness. I got a pack with the color lavander/purple. What kind of release will that give you? Hey. The purple tape will give you a slower release. On this tape the 1" is referring to the width of the tape. Can I reuse the tape? How many. Times? Hello! You can definitely reuse the tape as many times as it keeps sticking. Once the glue from the tape will not stick anymore, discard it and use a fresh one. Are these recommended if you have grips installed in the holes? Hello Maura. These are not recommended. We only recommend them if you have troubles with your fingers swelling or if something is rubbing your fingers. On this particular tape we only sell this by the package and each package contains 40 pieces of tape. I have lost some weight and my thumb is looser in the thumbhole now. How can I resolve that? You can always get grip inserts to put inside your ball to make the finger holes smaller. Is the “back” of thumb the nail side? It would be the part that is not on the nail side. Can I use this on nail side. Due to the time it takes to produce the VISE Pre-Cut Hada Patch 1" Tape ball it will ship in immediately. We cannot ship this ball outside the United States.